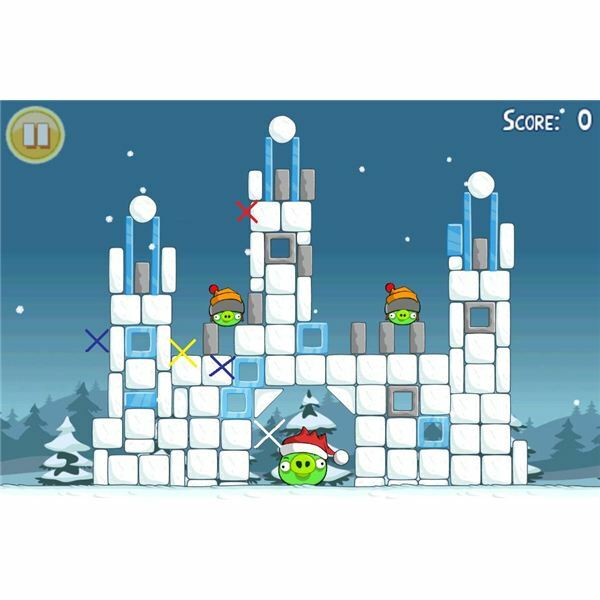 Throughout the Angry Birds Christmas Edition guide we've added pictures with an 'x' of each coloured bird to show you where to aim to get those 3 stars, so if you get stuck just refer to the 'x'. Red Bird – Aim this bird quite low so it shoots just above the stone triangle, this should kill the two pigs above and below where it lands. 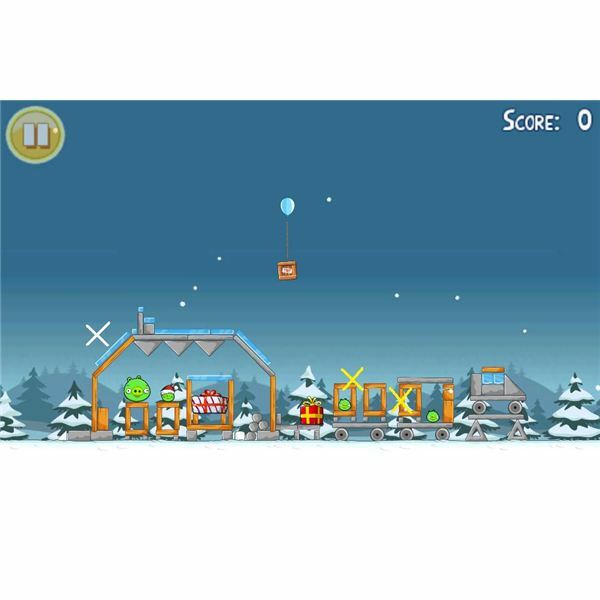 Yellow Bird – Aim this very high so it shoots high into the air to hit the top square and tap the screen to propel it just before it hits the snow. This will make the concrete slabs fall and kill all but the pig furthest away. 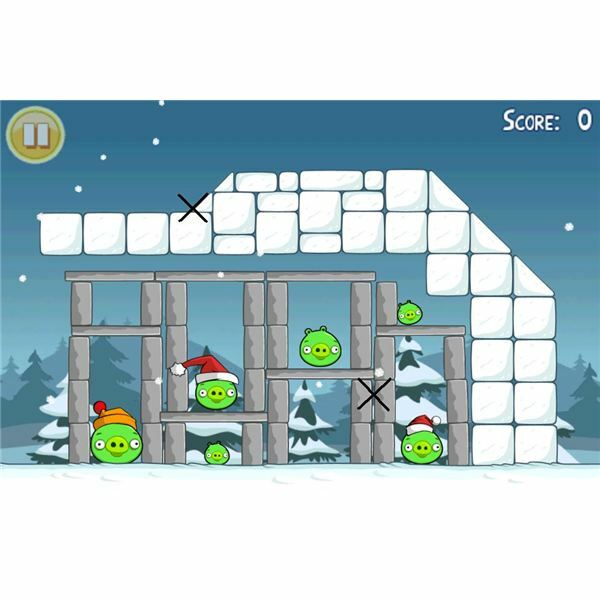 Red Bird – You need to aim this bird quite low as well, to hit the large square just under the last pig. This will kill the last one with a bird to spare. White Bird – You need to aim this egg-laying bird high enough to fly over the towers and tap it to drop the egg on the ledge between the furthest two towers. This will cause the furthest two towers to collapse and kill all of the pigs aside from the large one to the right. 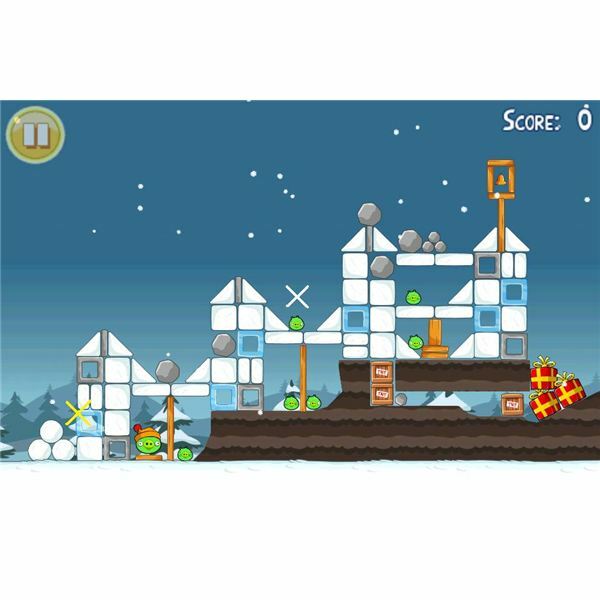 White Bird – You need to aim this bird as high as you can, it needs to tap the ledge just over the remaining frog, as it's about to touch tap it to drop the egg and it will demolish the last tower, giving you two birds to spare. Red Bird – Aim this bird quite low, it needs to hit the 'l' shape plate above the nearest pig. This will kill the pig and collapse the bottom of the structure leaving the big pig next to it vulnerable to attack. Blue Bird – You need to aim this one on the same path as the first, tapping it just before it comes to the snow structure, at the point of the blue cross in the picture below. 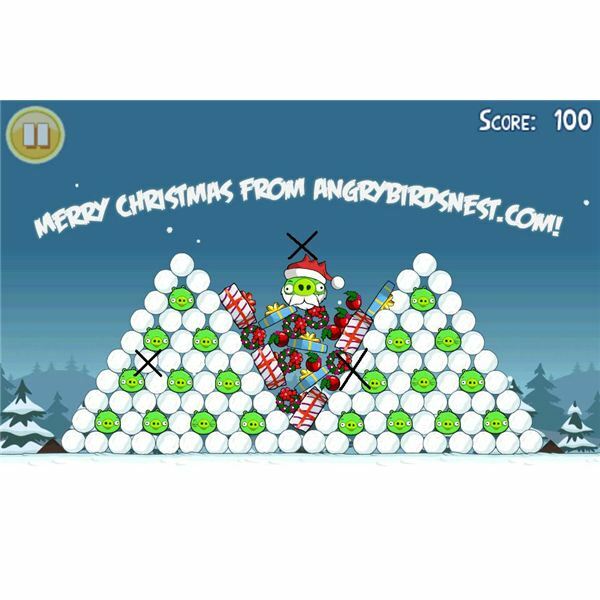 This will kill the remaining pigs and destroy the presents, giving you more points and two birds spare. Blue Bird – Aim this bird even with the land so it hits straight on and tap it when it gets to the second tree in the background to demolish the first snow tree and kill the pig on the ground. 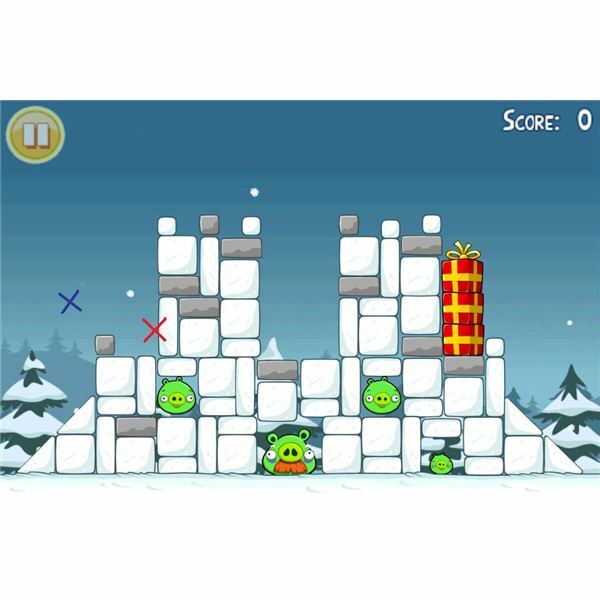 Yellow Bird – Aim this slightly higher than the first to hit the yellow 'x' in the picture and kill the other two pigs to the left of the structure. Red Bird – You need to aim this quite high, it needs to hit the triangle holding up the main structure. This will demolish it and kill all but the pig furthest away. 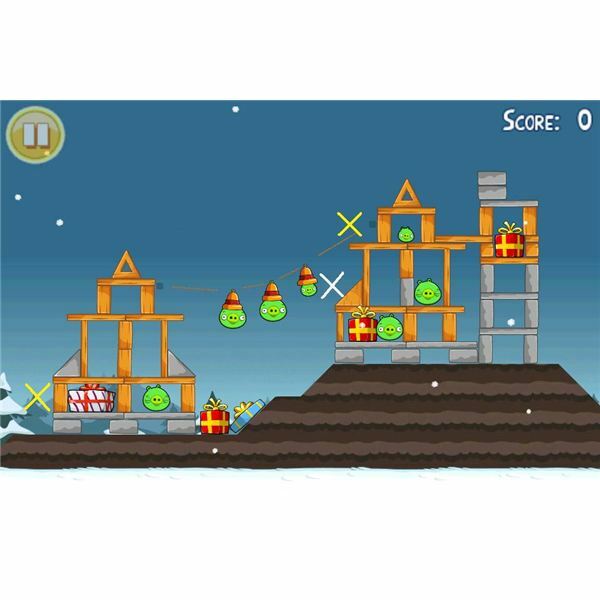 Yellow Bird – This bird needs to be aimed a little higher than the last, so it flies up over the rubble and hits the remaining pig from above. You should have 2 birds to spare. Red Bird – Aim this high and at an angle to hit the left square of the middle structure. The falling debris will kill the left pig. Blue Bird – This bird needs to be shot lower, it must hit and demolish the first structure so aim for the middle cut out square and tap just after it's released for maximum impact. Yellow Birds – Now shoot this bird in the same path, it needs to hit and make a partial path to the large pig on the floor. Blue Bird – Again, shoot this bird in the same path and just after it's gone tap to release the others. The pig should be in the open now. White Bird – Shoot this one in the same path, tap the screen to shoot it in the path of the pig higher up and the resulting impact will kill both. 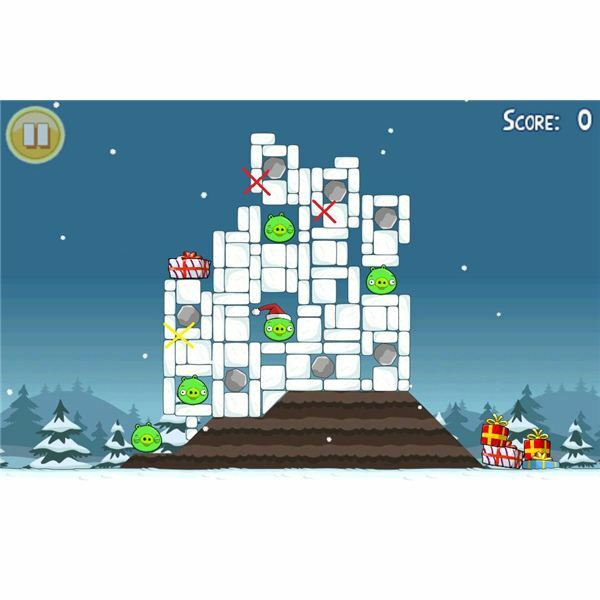 Go to page 2 for 3 stars on levels 7-12 of Angry Birds Christmas. 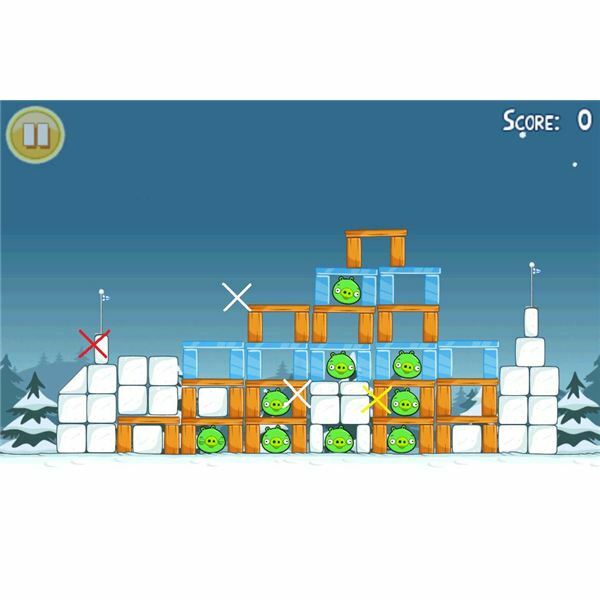 Black Bird – Aim this one high, it needs to hit the first slope on the structure and once it hits the first pig, tap the screen and it will blow up all but the furthest two pigs. Black Bird – This one needs to be aimed lower, straight towards the final two pigs. Once it hits the wall where they are tap to blow them both up. You'll have one bird to spare. Yellow Bird – Aim this one to hit the cut out square in the structure and tap the screen to propel it just before it hits for accuracy. This will collapse the middle and top killing two pigs. Yellow Bird – Shoot this one lower it must hit and kill the two pigs and blow up the TNT box to blow up the pig underneath them. Yellow Bird – Shoot this bird higher than the previous two to hit the last remaining pig at the top of what remains of the structure. White Bird – The first bird should be shot to hit the grey slabs nearest to it to collapse the whole first structure with the two pigs resting on it. Blue Bird – Aim this one for the middle of the tall structure and tap the screen just after shooting for maximum impact to collapse the second structure. Blue Bird – Shoot this one in the same path, tapping the screen in the same place to demolish most of the third structure and kill another pig. Yellow Bird – Aim this one in the same path and tap the screen in the same place again and this will kill the last pig leaving you a bird to spare. 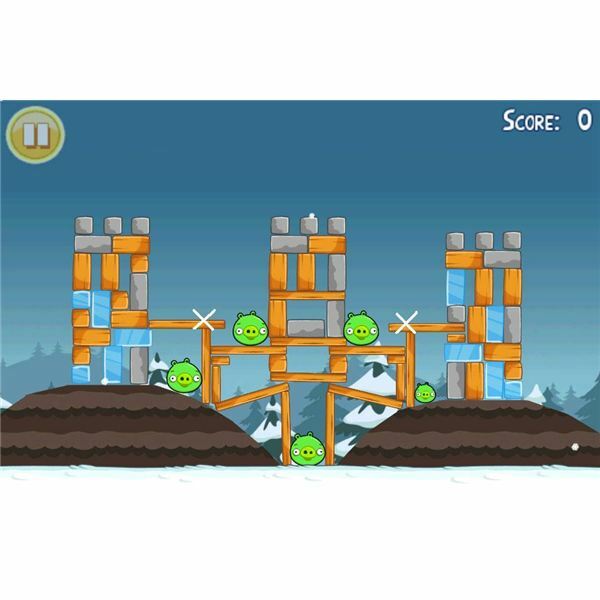 Red Bird – Aim this high, it must hit the bottom of the top boulder which will drop down, demolishing the middle of the structure and killing the two pigs below. Yellow Bird – Aim this in the same path and it will release the two boulders to the right. They will demolish more of the structure including the bonus presents and kill the pig under them. Yellow Bird – This one needs to hit just below the remaining boulder which will kill the last two pigs. Yellow Bird – This needs to be aimed to hit the marker in the middle of the first wooden structure to collapse it in the middle and side to kill the three pigs and a further 2 from the other side. White Bird – Aim this one high enough to go over what is left of the structure and tap to release the egg halfway between the two remaining pigs. This will kill them leaving one bird to spare. Yellow Bird – Aim this bird down slightly, it should hit the cut out square on the face of the structure killing two pigs. White bird – This bird needs to go a bit higher so that it just skims over the second tip and drop the egg on the pig resting on top. The bird will then fly up and hit the bottom of the boulder, this will release the rest of the boulders which will activate the TNT boxes and destroy the rest of the pigs and most of the structure giving you a bird to spare. 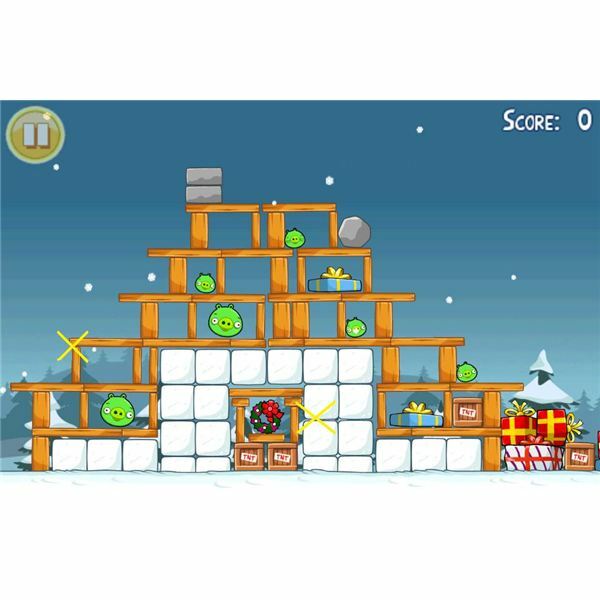 Go to page 3 for 3 stars on Angry Birds Christmas levels 13 – 18. 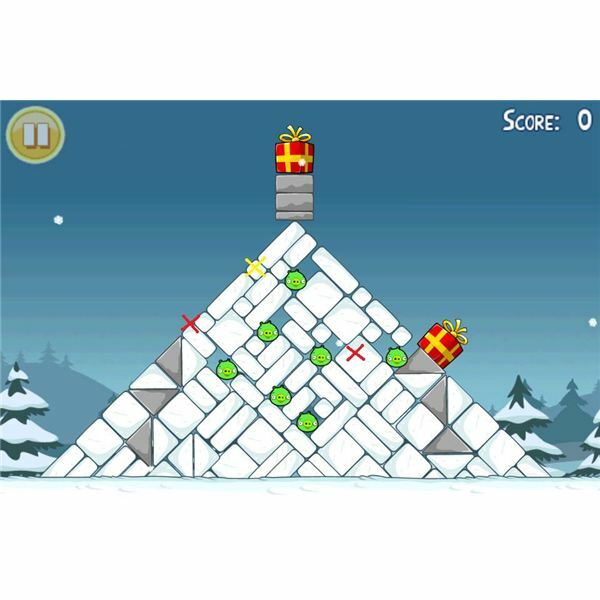 Yellow Bird – Aim this bird to fly over the first step to hit the second, tap the screen to speed it up to go through the wooden structure and through to the snow, collapsing the entire side of the structure killing 3 pigs and releasing the boulder to kill the pig on the opposite end. 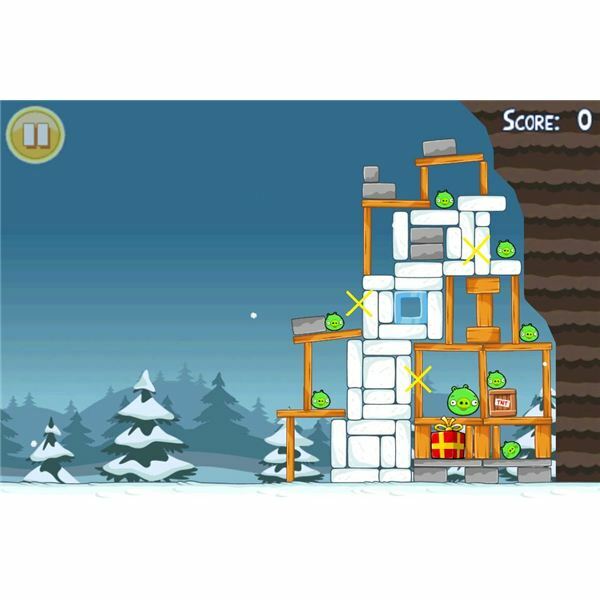 Yellow Bird – This bird needs to be aimed in the same path to go through the snow underneath the structure, demolishing it and killing the remaining pigs and leaving you a bird to spare. Black Bird – Aim this bird to hit just above the first step up. The resulting explosion will kill the closest three pigs. Black Bird – This one needs to hit the snow on the second step to collapse the structure. Black Bird – Aim this one much higher to hit the highest present head on to go straight through the remaining structure and kill the last pigs. 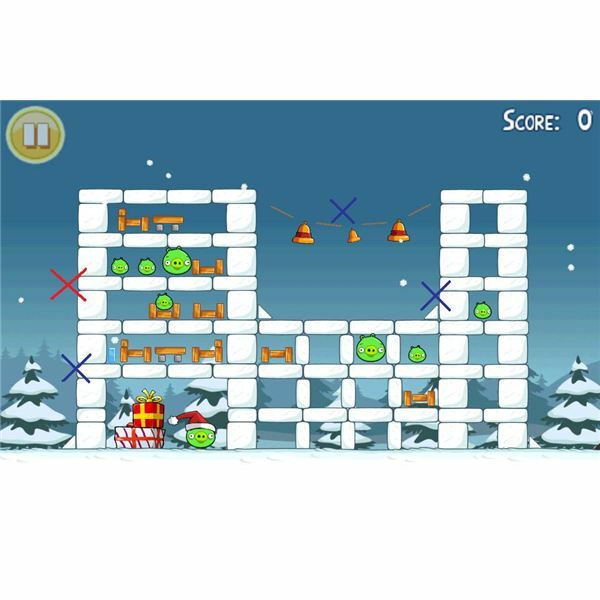 Yellow Bird – Aim the first bird to hit the left corner of the second tower. Tap it to sail straight through and tumble it to kill the pig below. 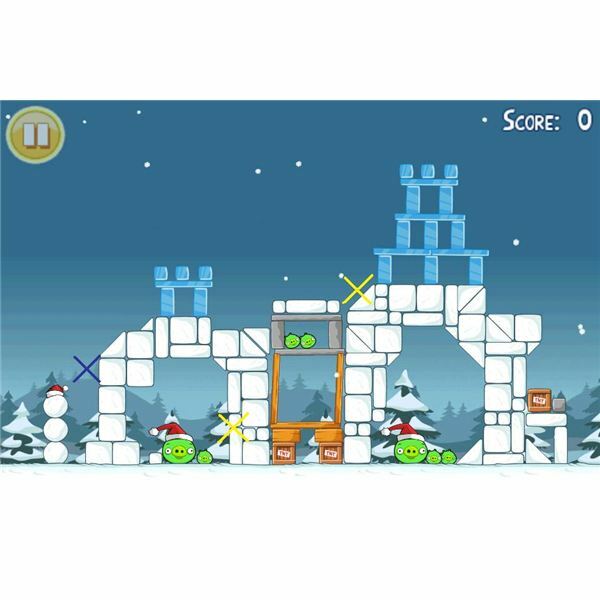 Blue Bird – Aim this one lower and tap for maximum impact to the closest side of the structure killing the two pigs. Yellow Bird – This bird needs to follow the same path and hit the TNT boxes to collapse the middle and kill the remaining pigs above. White Bird – This should be aimed to hit the corner of the second step which is wooden, at the last second release the egg and it should fly up hitting the next wooden step and snow to the side. Large Red Bird – Aim this one fairly low to hit the base of the flag. It will rip through killing a pig. White Bird – Aim this slightly higher to actually plough through and hit the snow in the middle. Don't worry about releasing the egg on this one. Yellow Bird – With most of the structure gone aim the last bird to hit the middle of the last remaining three pigs. This will collapse and kill them with a bird to spare. Red Bird – The first bird must be aimed to hit just below where the three pigs are resting to kill them and the one below. Blue Bird – Aim this one head on to hit the structure below where we first hit it to kill the last pig on the right side. Blue Bird – Aim the blue bird high and to hit the middle bell head on, not tapping the screen, to break the rope. This will fall into the snow below killing two pigs. 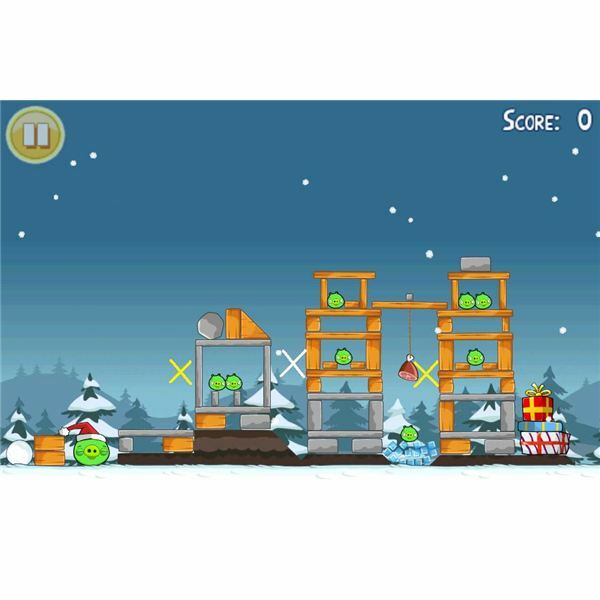 Blue Bird – This bird needs to go slightly lower and tap the screen so that one hits the remaining pig. 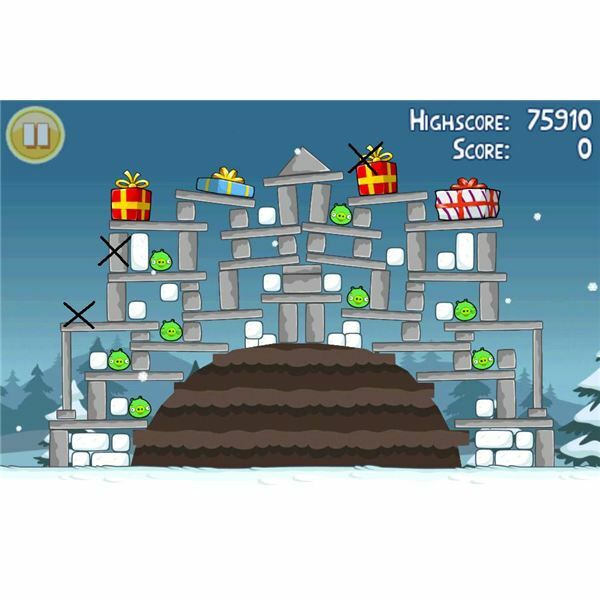 Black Bird – This is a bit trickier, try to aim the bird to land in the space in the snow just where the stone structure is exposed which will kill all but one pig and completely collapse the structure inside and outside the snow. Black Bird – Aim this bird to hit the pile of wooden rubble remaining to give you more points and blow everything remaining. Yellow Bird – Aim this quite low, it should be aimed to hit just before the last pig and skim over to kill it. 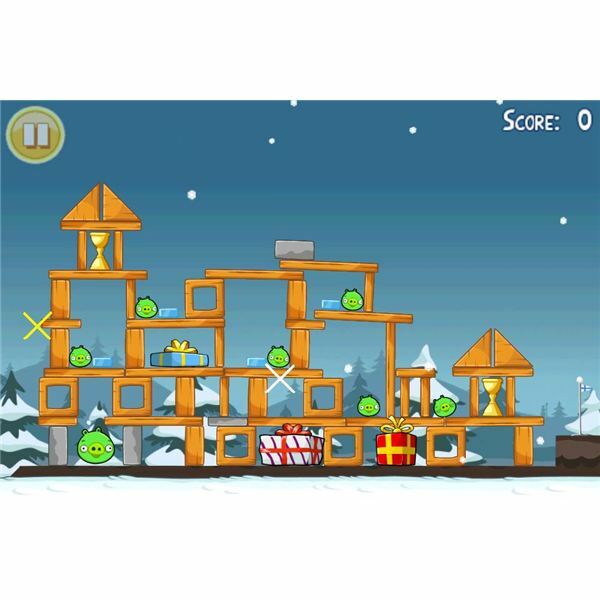 To get 3 stars on the remaining Angry Birds Christmas levels 19 – 25 go to page 4. 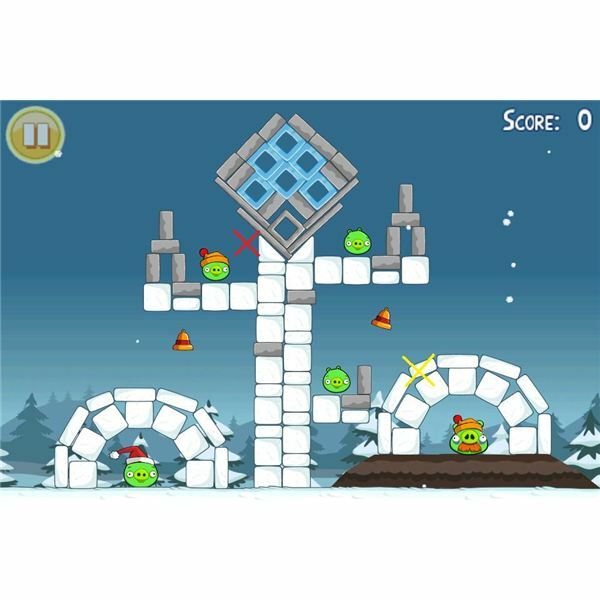 White Bird – Aim the first bird very high, it needs to go towards the middle of the two slabs on top of the towers. Once it's almost hit, tap to release the egg and it will destroy the middle and farthest sides killing two pigs. Yellow Bird – This needs to be aimed to hit the pig closest to it. White Bird – The white bird is then used to fly directly into the slab which is still intact and knock them down to kill the remaining pig. 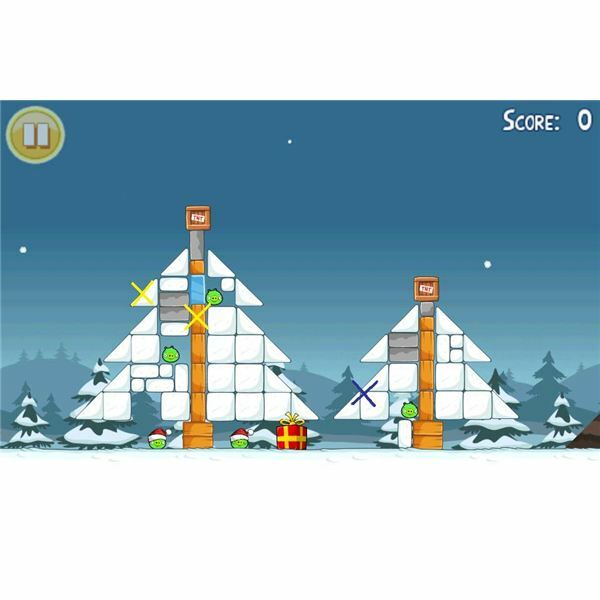 Yellow Bird – Shoot this one high into the air so that it hits the top left corner making up the tree. Tap the screen as it hits to ensure it collapses half of the structure, killing the pigs on that side. Yellow Bird – Aim this one so that it hits the top wooden slab collapsing what is left and killing the other pig in the tree. 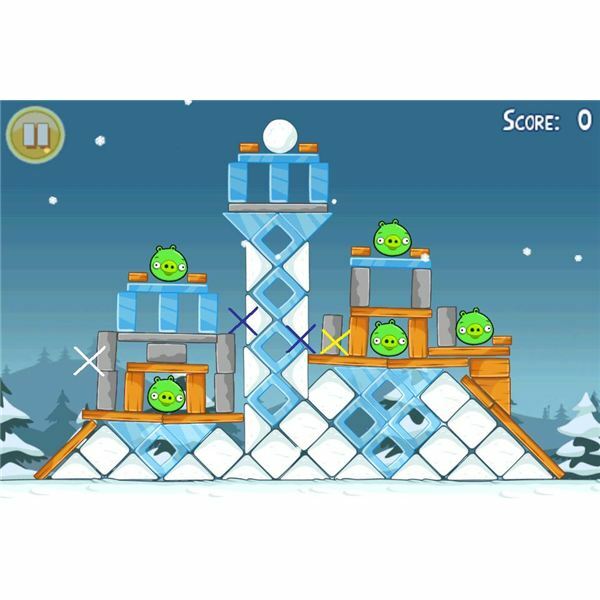 Blue Bird – Aim this one in the same path and tap the screen so that it collapses and kills the final pig in the second structure. Large Red Bird – Aim this one high so it falls just below the balloon and falls to kill the pigs below. Yellow Bird – Aim this one to hit the pig enclosed to the left and tap before it hits so that it will skim through and hit any remaining, leaving just one pig on the far end. 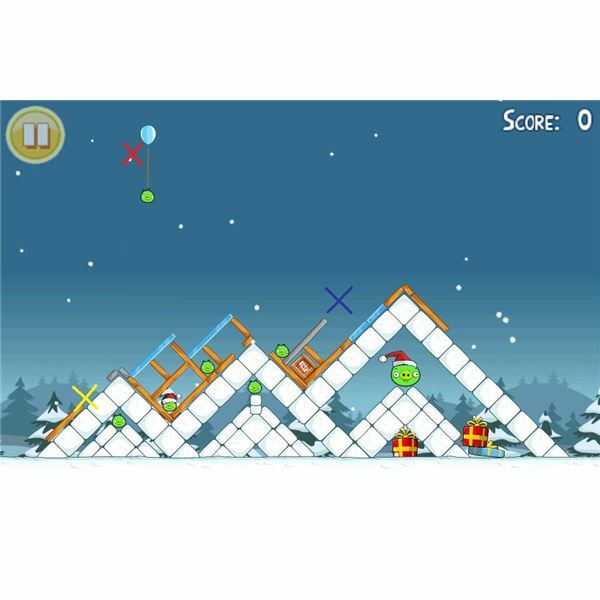 Blue Bird – The last bird must hit the snow and tap the screen just before so that at least one hits the last pig. Yellow Bird – This bird must be aimed slightly above the ground level to hit the stone support pole in the middle to knock it down, killing two pigs and the boulder is released and rolls to kill the third. White Bird – Aim the next one slightly above the last and it should be aimed to near the bottom of the wooden structure in the way. Just before it hits tap the screen to drop the egg and it will shoot up to knock the structure down. There will be three remaining pigs. Yellow Bird – Hit this one in the same path as the previous one, and tap to increase speed and it will hit one pig, making the others fall and die. This one will take quite a bit of practice to perfect but will give you the highest possible scores. Yellow Bird – Aim this one directly at the present to the bottom of the first structure. This will kill the first pig. Yellow Bird – This needs to be aimed at the corner of the right side structure, it will disable the rope and bring down the structure leaving one pig left. White Bird – The last bird needs to be aimed higher than the last to land directly on the triangle shape next to the last pig, once it's almost touching tap the screen and the bird will shoot up and collapse the rest of it killing the final pig. 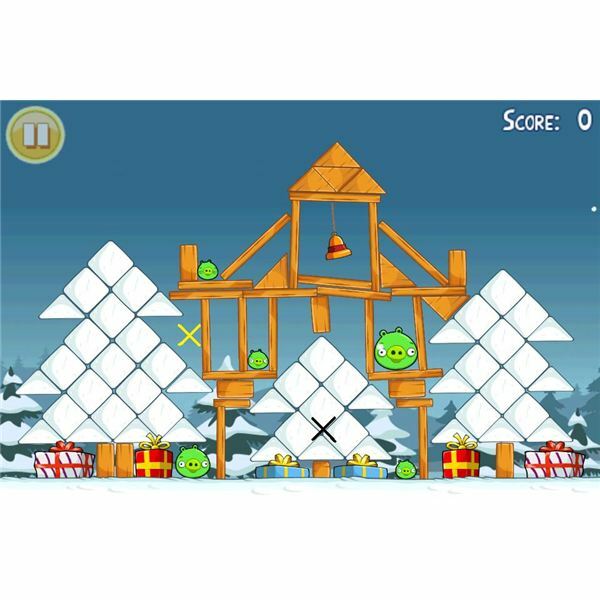 White Bird – Aim the bird at the wooden beam of the closest structure to leave only the two furthest pigs left. 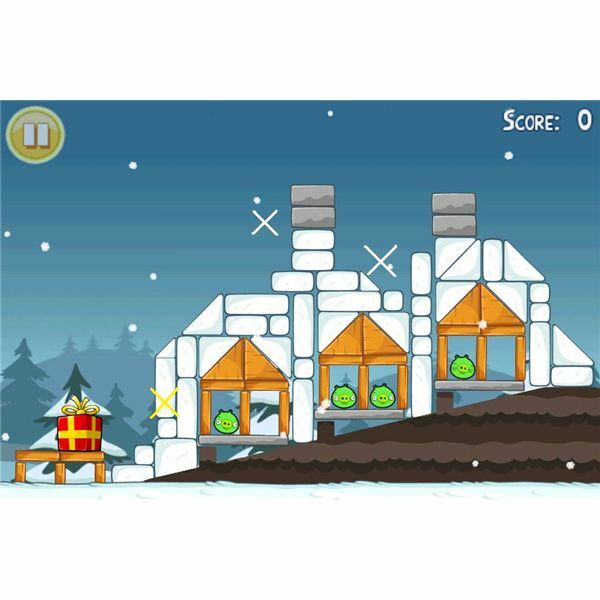 Yellow Bird – Shoot the yellow bird higher to hit the wood rubble just above where the nearest pig is and it will destroy the wood and roll on the pig. Yello Bird – Aim the next one higher still, it should go through the wood when you tap the screen before it hits and kills the last pig. 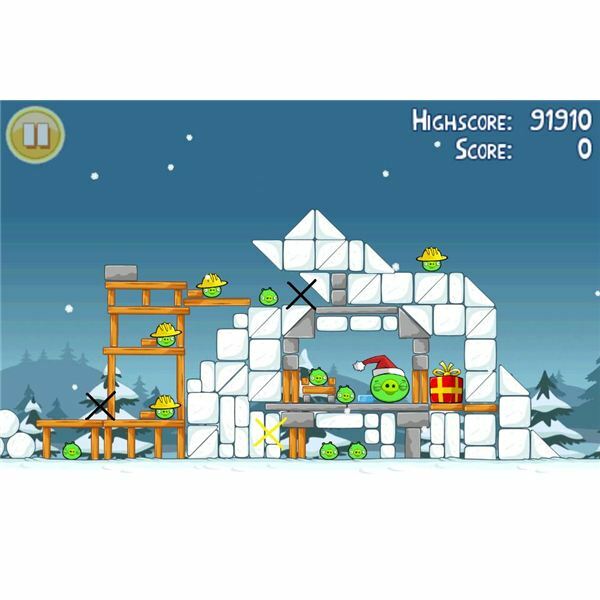 Black Bird – Aim the first one high, it needs to land directly on the middle pig before you tap the screen, killing pigs and moving the snowballs down from each side. Black Bird – The next one needs to go a bit higher to strike further to the right of the inside gap, this will kill the remainder of the pigs on the right hill. Black Bird – Shoot the third one to the left hill, aiming for the middle pigs. Blow this up when in the structure and it will kill the remaining pigs. I hope this guide has been a help in getting you 3 star status on Angry Birds Seasons Christmas!